From tiki-lit skating and hearty French bistro fare, winter actually is the time to visit the Ottawa Valley. Ottawa has – recently, and more than once – been voted Canada's most liveable city. But did you know that just at its doorstep lies a treasure trove of adventure, no matter what the season? 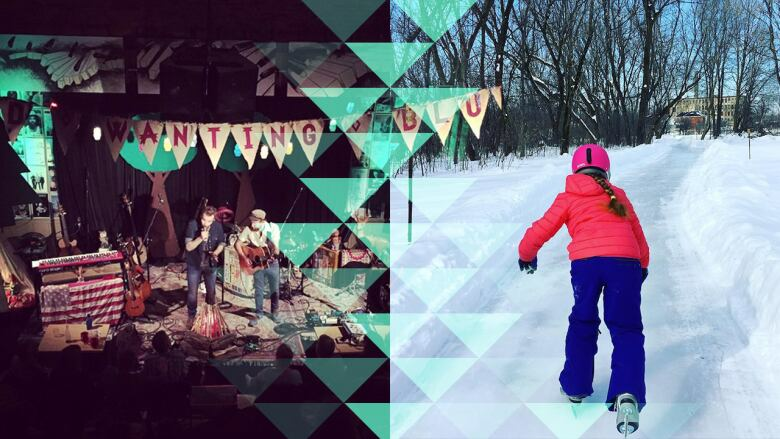 From a historical theatre to tiki torch-lit skating, the Ottawa Valley will put rose-coloured glasses on your winter blues. Not so long ago, it was the last place on earth – or, at least, in Ontario – you'd expect foodies to flock. Now, Carleton Place is home to the Black Tartan Kitchen, where the seasonal, local menu draws diners from across town and country. Helmed by Ian Carswell, former head chef at the National Gallery of Canada and one-time cook at Helsinki's "Chez Dominique" (voted of the world's 50 best restaurants in 2009), the Tartan offers classic and modern French fare, along with tasting menus and a BYO night. Bonus: all proceeds from sales of its sourdough bread go to the Y's Owl Maclure, a division of Autism Spectrum Disorder Services. One of the Valley's most beloved towns, Perth is known for stunning heritage buildings, waterfront views, an artsy vibe and friendly locals. But it's also the stomping ground for Perth Outfitters, a family-run rental shop offering everything to enhance your outdoor Valley experience. In the colder months, this includes the creation and maintenance of a magical 400-metre groomed skating trail through the woods, and a shinny hockey rink. Tiki-lit skating on Friday and Saturday nights… a woodstove-warmed log cabin… hot chocolate, apple cider and marshmallows on offer… are you lacing your skates yet? The super helpful staff also accommodates groups, schools and parties. If you fancy traveling back in time to the Valley's days of yore, make an evening of it at Arnprior's O'Brien Theatre. Originally built in 1909, the theatre's earliest days were as a cinema and a Vaudeville performance house. It has seen many incarnations since, but in 2000, the theatre was refurbished to its 1930s splendour. Although it has modern picture and sound equipment, and features current-day Hollywood films, the O'Brien is not part of any major theatre chain. Which means that, unlike other places we won't mention, two tickets and a large popcorn won't break the bank. Live music fans rejoiced when, after a yearlong closure, the Neat Coffee Shop reopened in March of 2017. And while this former 19th-century schoolhouse still features live acts of all genres (Ben Kaplan, Lindi Ortega and the Julian Taylor Band are on the roster for the coming months) and serves wood-fired pizzas with guitar solo-inspiring names (see: Jack White, Ziggy Stardust), the cozy spot also hosts comedians from across the country, and an inspiring speaker series. With a capacity of only 86, seeing any performance is here is like enjoying it in your living room – if your living room served espressos and Swiss Portobello burgers. Bands tend to play Thursday to Saturday nights, but are known to stop by on weeknights as well. There's no cure for a chill like hugging a baby alpaca. Feed, snuggle and selfie to your heart's delight with furry friends of all sizes at Perth's Serendipity Farm, home to over 50 alpacas and llamas. The family-run farm is open weekends and holidays from 10am - 4pm, and weekdays by appointment (book a couple of days in advance). Once you're loved up on long-necked creatures, trundle over to the shop to peruse the softest sweaters, mittens, socks and hats in the land, and the roving and wool that make them. Admission is free, but the farm accepts cash donations for the Lanark Food Bank. Natalie Karneef is a writer, writing coach and podcaster. Find her at nataliekarneef.com.